Recently I had the tremendous pleasure of making a tutu for one of my favourite babies in the whole world. The occasion was her 1st birthday and I convinced her mama to let me take a crack at making an outfit for her photos. Amy, thanks for taking a chance on me! 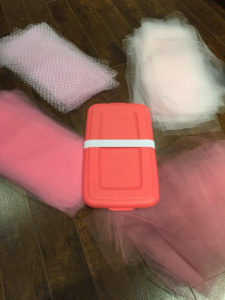 I had a vision of a very full tutu with several shades of pink, but I also knew I wanted lots of texture! I decided to make a tutu with an elastic waist as opposed to a ribbon waist. Ribbon (specifically the bow) can be difficult to position properly on a squirmy baby for photos, so I played it safe. I looked up measurements for a 12 month old baby girl and most people agreed that 15 inches seemed to be the average waist circumference, and a tutu 8 inches in length seemed appropriate. I headed on over to our local Fabricville store and found the perfect combination of tulle. 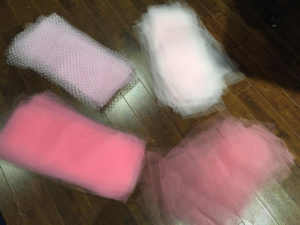 I selected baby pink, bubblegum pink, dusty rose, gold and bubblegum pink flocked tulle. I got less of the dusty rose, flocked and gold as I knew those would be accent pieces. I used 9 meters of tulle in total, with very little left over, surprisingly. 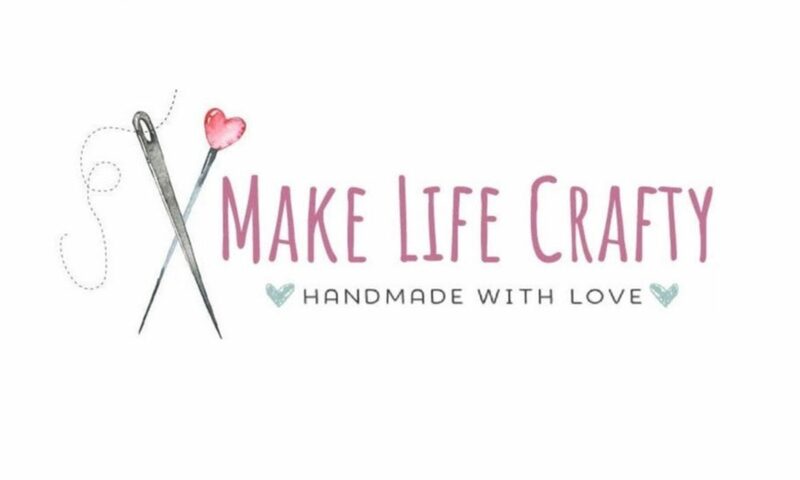 I used 1 inch elastic and formed a loop, overlapping and stitching the ends together. The loop needed to be 15 inches when complete, so I cut 16.5 inches to allow a decent overlap. I used clips to hold it in place. 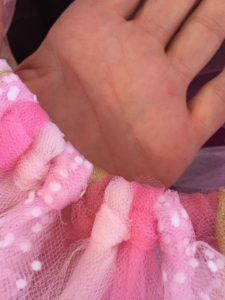 I then stitched the overlap of the elastic together. 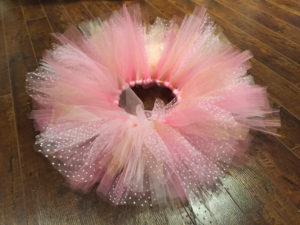 To make the tutu I would cut strips of tulle just over double the length I needed, as the tulle would fold in half over the elastic and would be looped in place. So I smoothed out the tulle and cut strips that were 6 inches wide by 16 or 17 inches long. 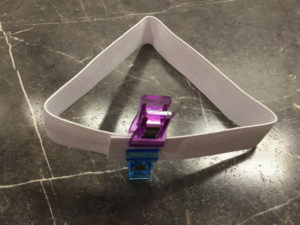 I wasn’t too precise with this as I knew I could trim pieces when I was done. I forgot to get a photo of the gold once it was cut, but you get the idea. Next I looped the elastic waistband over the lid of a container I had. Some people use cardboard, but you can use whatever you have. To secure the tulle over the elastic I folded each piece in half. Lay the folded tulle flat against the elastic, wrap the cut edges around the elastic and pull through the loop at the top. Pull tightly to secure. Make sure you are wrapping in the same direction for each piece of tulle. I added the tulle fairly methodically, particularly when I was adding in the flocked, gold and dusty rose tulle. I wanted to ensure they were evenly spaced, so I roughly alternated colours. Once it was done I took a final measurement of the waistband (as adding in a lot of fabric can make the elastic stretch) and laid the tutu flat for an inspection. I trimmed the longer pieces to ensure it was the proper length all around. 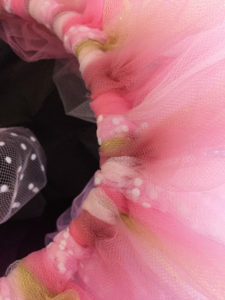 If you do notice that your waistband has stretched, removing a few pieces of tulle evenly throughout the tutu will help. The tutu ended up being exactly as full and textured as I had hoped. I loved making it and it took about 90 minutes in total, including the time it took to cut the tulle. Happy 1st Birthday, little sweetheart!